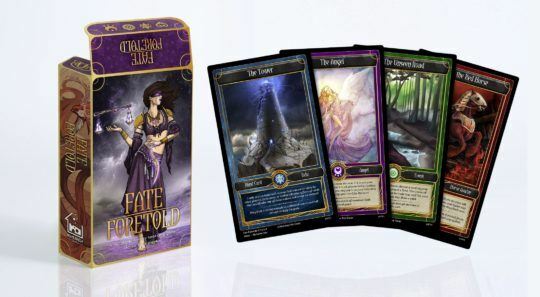 Description from the publisher: Fate Foretold is a tarot-inspired strategy card game where players race against one another to take control of Fate itself. Fate Foretold is honed and crafted to inspire hours of fun and epic gameplay for you and your friends. Gather around the table and take a turn at tempting fate. Use your wits and all the luck you can gather to make it through victorious! Pledge allegiance to kings, gain a spell from a witch, heed warnings in constellations, and use the power of the Four Horses of the Apocalypse to bring ruin to your enemies and emerge as the victor! Fate Foretold is a brilliantly illustrated creator-owned card game designed for 2 to 6 people.